Tolton’s grave in the fog. Above is a quick Picture that I snapped with my iPhone this morning as I headed back to my Grandparent’s from morning Mass at St. Francis Solanus in Quincy. There was fog everywhere from when I left Springfield, on. And it didn’t leave us until mid-day”ish”. Fr. Augustus Tolton is the first African-American priest in America, he was a parishioner at my home parish where my Sacramental Records are kept. Great man who suffered a lot, but led many souls to Christ. The Fog just looked really soothing and eerie around his grave in St. Peter’s Cemetery this morning. Pray for his cause for Sainthood which is being put forward by the Arch-Diocese of Chicago. You can check out Fr. 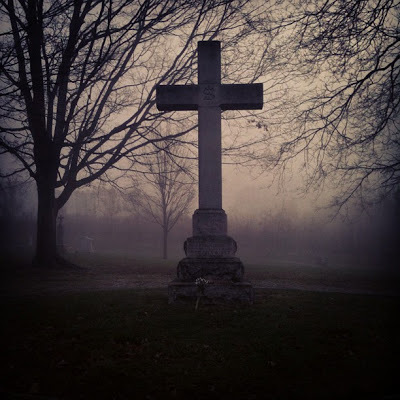 Daren Zehnle’s blog here for his post of my picture and more of his blog posts about Fr. Tolton and his cause for sainthood. Have a blessed Thanksgiving! Please pray for me, I’m praying for you all!